Pouting, whining, and sulking are three of the most annoying ways that kids communicate their displeasure, anger, or frustration with a situation. This behavior is not just limited to young children, either—teens do it because they haven’t always learned the skills to express their frustration in an appropriate way. Simply put: it works for them. 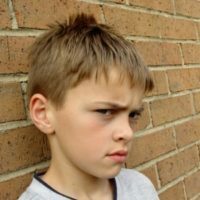 When kids or even teens walk around the house in a huff in order to get their way, that means someone—probably one or both parents—is still reacting to it. But know this: if you start blaming, accusing, or trying to reason with your child about this type of behavior, you’re just feeding the tiger—you’re simply giving it more meat. The behavior will continue as long as you continue to react to it. As your child grows older, they’re supposed to learn ways to express their displeasure, frustration, anger or anxiety about a situation. Most kids are eventually able to do this most of the time. But some kids persist in sulking. It’s not unusual to see children continue this all the way up into grade school and beyond. Remember, the behaviors kids tend to continue are the behaviors that are meeting their needs. And until your child learns other, more effective ways of communicating, it will probably continue. Your child’s freedom to speak his mind assumes one primary condition: that it’s safe to express himself in your house. Don’t forget, this behavior may be a replacement form of communication for kids who don’t feel safe saying what they really want to say. Instead, they use other, more passive methods to let people know they’re unhappy, without actually having to take responsibility for it. I wouldn’t give pouting and sulking too much power by overreacting to it or punishing your child. I personally wouldn’t give consequences for it, either. After having the conversation with your child about other ways they can express themselves, I would ignore the behavior completely. But here’s the key: whether they’re sulking or not, your child still has to comply with your rules and do what you’ve asked of them. If they behave oppositionally or defiantly because of your requests, then deal with that behavior. Although it’s annoying, try to stop responding to the fact that your teen is walking around the house with a huffy attitude. Remember, deal with behaviors that are more easily observable and are more “acting-out” in nature. So, allowing your child to be in a sulky mood and not responding to it is the best way to get out of it. Let it die by neglect. In fact, like plants, a lot of these behaviors do die from neglect. If you leave them alone, they’ll die. If you water them and nourish them, they continue to grow. It’s as simple as that. Whining is another annoying way kids have of expressing themselves. You see a lot of people complaining all the time about things they can’t change. People blame others for their emotional state regularly. When people constantly complain about problems, emotions, or situations, they’re not willing to do anything positive about them. You’ll hear wealthy people whine, you’ll hear poor people whine. You’ll hear conservatives whine, you’ll hear liberals whine. And in the midst of that, you’ll hear children whining. Now, the emotional state that accompanies whining is usually that of feeling sorry for yourself. So maybe something’s not going your child’s way. They’re not getting something they want, or they’re afraid they’re going to lose something they’ve got. All of this contributes to the level and intensity of the whining. What I like to do is to give kids a journal in which they can write their complaints. They get to complain about something once, and afterwards they have to write about it in their journals. Set aside a certain time every day when your child gets ten minutes to complain, discuss what’s bothering them, and let them whine. At the end of the ten minutes (and it has to end on time—use a little egg timer), everybody goes their way. Your child gets another chance tomorrow during complaint time or whatever you choose to call it. This will help extinguish the constant whining. By the way, when you establish a complaint time (or whining time), your child will have to work to find things to complain about. The whining stops because most kids don’t want to do the work—they just want to complain. And if they do complain, you can tell them to write it in their journals or save it for the complaint time tomorrow. One Parent Gives In, the Other Doesn’t: What to Do? It’s common to see kids who sulk and whine at home but not at school. This is because they’ve learned it’s not going to work at school: their teachers don’t respond to them the same way their parents do. Sound parenting requires that both parents communicate with each other separately from their children. If there’s no TV after seven o’clock at night, that’s a house rule. If one parent allows sulking to change that, then there’s something wrong with the couple’s communication. There’s nothing wrong with the kid—he’s just doing what works, after all. Here’s the bottom line: It’s up to both parents to create a culture of accountability between them and their children. And that culture of accountability says, “You’re accountable to me and I’m accountable to you. And no matter what else is going on with other people, you have to speak to me in a certain way and I’m going to speak to you in a certain way.” End of story. Develop an effective strategy on how you’ll deal with your child’s annoying behaviors, and you’ll soon see that behavior wither and die.